Though it reports to rank highest in race-class interaction, Rice is not the most socially aware campus in the United States by a long stretch, nor does it advertise itself to be. Having researched the cultural climate of Rice in the 1960s last semester, I’d argue that this isn’t a new phenomenon. While we can’t change the core of our student culture, we can and ought to think more critically about our social history, which is necessary to acknowledge as we shape our current culture. The recent uncovering of photographs of students in blackface and other records of racism on campus — cultural artifacts hidden in plain sight in public archives — have demanded our attention and sparked conversations among students, faculty and administrators. The fact that Rice fits into a larger pattern of racism and exclusionary tactics across American campuses does not mean we should cast this history aside. We ought to critically engage with our history as a predominantly white institution, and pointing out where and when infrastructure has failed our institution’s students of color is a good place to start. When I started researching the desegregation of Rice for my final paper in HIST 421: Race, Education and Society in the American South, I assumed that the announcement of the university’s desegregation would have produced a wide range of reactions in the news, in Rice publications and other sources. I was mistaken. As evidenced by records from the The Rice Thresher, local Houston and Texan newspapers, and through interviews of professors like Ira Gruber, Chandler Davidson, and Louis Galambos, it is very likely that the social shift did not bring about a monumental reaction or event of any kind in the days, weeks and even months after the decision. Rice was legally permitted to desegregate in 1964 after the Board of Trustees voted to change the founding charter, but the institution endured a lawsuit that eventually upheld the ruling by 1967. By the time Rice got court approval, many top-tier universities and Southern neighbors had already desegregated, so there wasn’t much worth noting in newspaper coverage. That said, internal Rice documentation of the process, at least what’s available for public access, is sparse. There are very few records of meetings between board members, faculty, administration and others on how to prepare Rice for desegregation. The university changed the general admissions strategy overall, as indicated by Faculty Senate records and in faculty interviews, but the administration and Board of Trustees made no other significant efforts to accommodate black students. As black students began to enroll, it appears that administrators assumed they would settle into the pre-existing structure and carve out a Rice experience for themselves. These assumptions skirted the possibility of actually integrating students through direct outreach and support. Several professors interviewed, including Galambos and Gruber, mentioned that they met off-campus to discuss this and other social issues in small groups, but Faculty Senate records show their ideas were not implemented. When looking back on the most dramatic instances of student and faculty-driven protest on campus in the 1960s and early ’70s, the professors I interviewed mentioned non-racial events. The loudest event, figuratively speaking, was the so-called Masterson controversy in 1969. Dissatisfaction over the Board of Trustees’ appointment of a new university president without consulting students and faculty members sparked a campus-wide strike. In this instance the power of the collective succeeded, and Masterson opted to step down himself. The Vietnam War was the second-largest source of dissent in professors’ memories. 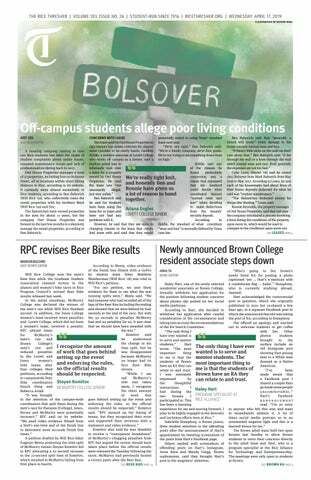 The conflict did raise a variety of social concerns, yet one cannot argue that it distinctly placed race at the forefront of Rice students’ complaints. It is not surprising that Rice did not have a campus-wide summit or reckoning or cultural shift upon desegregating. What we now remember as monumental social shifts in fact only inspired minimal reactions from university administrations across the nation, and one could even argue that Rice was on the more productive side of the coin. Rice students voted as an overwhelming majority to desegregate the campus in the Thresher’s poll that followed a SA Senate referendum calling for desegregation in December of 1961. Overtly racist op-eds published in our newspaper were typically met with chiding responses in the following week’s Thresher issue from faculty and students. The campus was not violently shaken by race riots. Private endowment funding, as far as I could tell, was not dramatically disrupted by racist donors pulling out of their commitments to give to the institution. In short, little changed before or after desegregation, but this inaction is troubling: I would argue this lack of activity made members of the school socially complacent. As professors I interviewed pointed out, in the 1960s Rice was radically reshaping its idea of the university experience by expanding the residential college system. The culture among faculty members shifted from the attitudes of the tuition-free Rice Institute, where they took their jobs to be research-focused at the expense of student interaction, to an intensive engagement model where students increasingly interacted with professors and staff at Associates’ nNights and in extracurriculars. This may have been enough to argue that Rice was doing an acceptable job of becoming an all-inclusive environment in comparison to its collegiate peers, but ultimately it is insufficient. One can conclude that the opportunities for enrichment and socialization largely affected the average white male’s experience at the institution. It is great that we can track the traditions that have shaped Rice’s unique culture into what it is today, but such an experience was designed with its majority white student body in mind and was never given the space to intentionally reshape its infrastructure to better encompass student racial diversity. By any present-day standards, Rice failed to support the black students that it actively went out and recruited. During the time period between desegregation and today, a lack of infrastructure undoubtedly hindered the black student experience. This absence of support was not for lack of trying, at least on the faculty level. Professors had the drive to lead productive conversations and develop programming that would critically support the black experience of the first classes of Rice students. The late Alan Grob led a body called the Minority Admissions Council, which was a standing committee of the Faculty Senate that grew to add student involvement through the SA but unfortunately only lasted for a couple of years, as Faculty Senate records in the Woodson Archives show. This committee outlined a multi-tiered program featuring admissions and tutoring initiatives designed to better the experience of minority students. Given the lack of attention paid to the cause in the Faculty Senate archival documents, it is evident that the administration’s lack of attention or interest, intentional or otherwise, curtailed the potential of such ideas. Even those who staunchly oppose affirmative action would likely agree that many of the resources that Grob proposed, like summer preparation courses and additional meetings and presentations on the college experience, were common-sense enhancements to the Rice experience. Unfortunately, it would take decades for preparatory programs to emerge (the Rice Emerging Scholars Program, for example, started in 2012). The Faculty Senate minutes acknowledged Grob’s ideas but show that the Senate did not discuss them nor allocate funding or personnel to see them through. The Minority Admissions Council, arguably one of the most progressive initiatives proposed to the Senate over these years, was limited in scope to recruiting high school students rather than welcoming and preparing admitted students to life at Rice. Mentorship programs and affinity groups emerged over time, but they were not given funding and faculty support soon enough. Looking back on the memories of professors in the 1960s by no means generated a sufficient, by statistical grounds, sample of experiences to draw from. It generated a largely white perspective that I supplemented with student reactions in contemporary Threshers and pre-existing research done on the topic, including the work of Rice historian Melissa Kean and former Ph.D. student Kerri Danielle Gantz. This is not to say that librarians, other researchers and writers on our campus have ignored the issue, but the individual efforts and events hosted have not produced what I would deem to be a larger social reckoning, particularly of white students and board members’ facing the situation head-on and acknowledging the uneven privileges afforded to white folks at Rice. As Jeremiah Murrell noted when interviewed in a recent Thresher article, hosting these conversations at the Gregory School, located off-campus, is only a tiny step along the way to directly exposing students to the truths of our institution. The Fifty Years of Black Rice at Life events marked a time for celebration and reunion of black and other voices at Rice, but these commemorations were limited in scope, especially because Rice did not commit one of its own spaces to the celebration. We cannot be satisfied with these events alone as this would risk overlooking other infrastructural issues that deny support to community members of color, black and otherwise, who work for, learn at and engage with the university. We cannot change the fact that Rice was not an ideal place for students who matriculated in the wake of the Charter trial. But we can be cognizant of the way that this institution has ignored the needs of nonwhite students. We must chronicle their experiences through historical and sociological research and interviews more fully; without anecdotal evidence, we have no way of concluding where and how Rice has improved its support mechanisms for non-white individuals within the predominantly white institution. We must continue to celebrate and support the courage and excellence of black students and every other minority. It is important to remember that Rice is not the product just of its forward-thinking, and mostly-inclusive student body and faculty. We are an institution affected by our problematic past, just as any other.Without further recognition, research and dedication to these issues, we risk complacency.